If you read the post about the well-connected Google Reader, you probably anticipated this chain reaction. All the services that integrated with Google Reader will remove their features, now that Reader is gone. 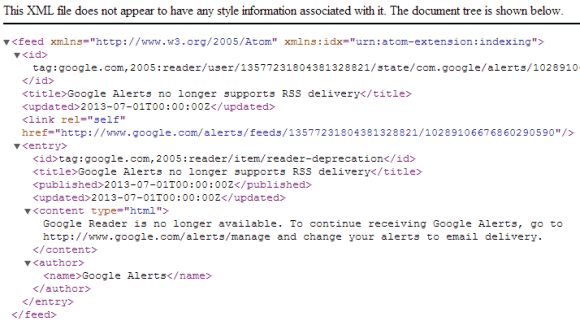 Google Alerts no longer supports RSS delivery and recommends users to switch to email delivery. "Google Reader is no longer available. To continue receiving Google Alerts, go to http://www.google.com/alerts/manage and change your alerts to email delivery," says Google. You're probably wondering: what's the connection between Google Alerts feeds and Google Reader? Google Alerts feeds, which were added back in 2008, had public URLs and you could use any feed reader to subscribe to them. The trouble is that the feeds were generated by Google Reader and were actually a Google Reader feature, just like the web page monitoring feature. Unfortunately, Google doesn't offer feeds for search results and the Web Search API has been deprecated and it was too limited to create a service like Google Alerts. The only obvious alternative is to screenscrape Google results. Talkwalker Alerts looks almost like Google Alerts and offers both email alerts and feeds. The service is free for up to 100 alerts.